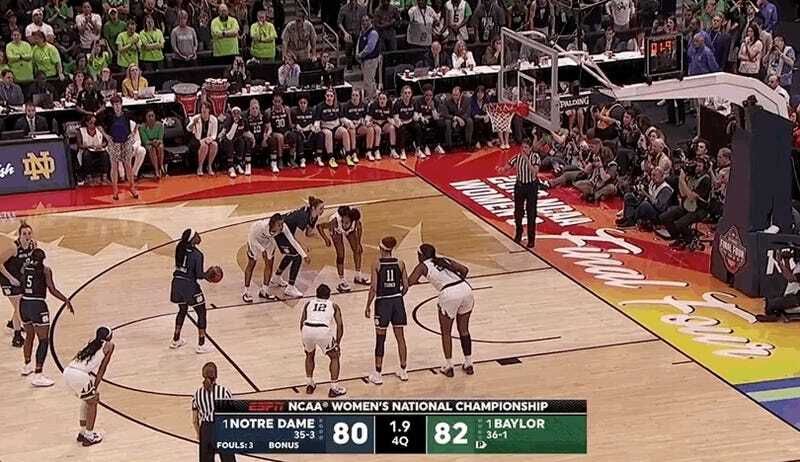 After a clutch layup from Maryland native Chloe Jackson put Baylor up 83-81 in the NCAA Women’s Championship, Notre Dame advanced the ball past midcourt to set up an out-of-bounds play from a timeout. It didn’t matter if the Fighting Irish intended on going for the win or overtime, because everyone in the arena knew that the ball would at least be going into the hands of Arike Ogunbowale, clutch-shooter extraordinaire. As expected, Ogunbowale got the ball, drove to the hoop and was fouled (that last part was probably not quite as expected). It seemed like Notre Dame was handed a lifeline with an 81 percent free-throw shooter headed to the line. But that pesky 19 percent made its way out into the open at the worst possible time and caused the first free throw to rim out. No matter, she more or less said to coach Muffet McGraw, I’ll just miss the second one on purpose and hope a teammate grabs a rebound. When she shot her second free throw, the 81 percent made an inopportune return and the ball went in with only the slightest kiss of the rim.